Sweater: Free People | Jeans: Necessary Clothing (old) similar here | Booties: Charlotte Russe (only $25) | Bag: Target | Sunglasses: Quay Australia | Lipstick: MAC in "Snob"
Here is the same sweater I wore a few weeks ago in white! It is seriously one of my favorite sweaters. And these boots! Oh, these boots! 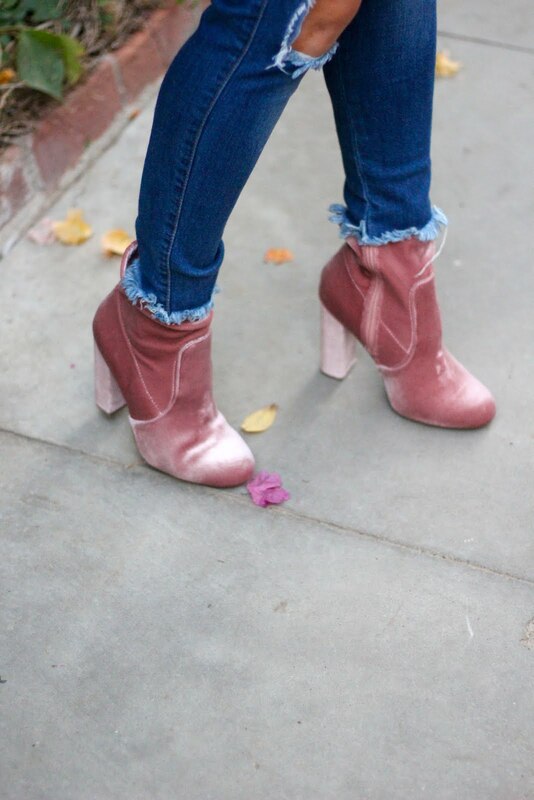 My three favorite things: Blush, Velvet, and Sale! They are the perfect heel height and fit like a glove. They are so cute paired with skirts and dresses. Snag them now, because they go fast! !